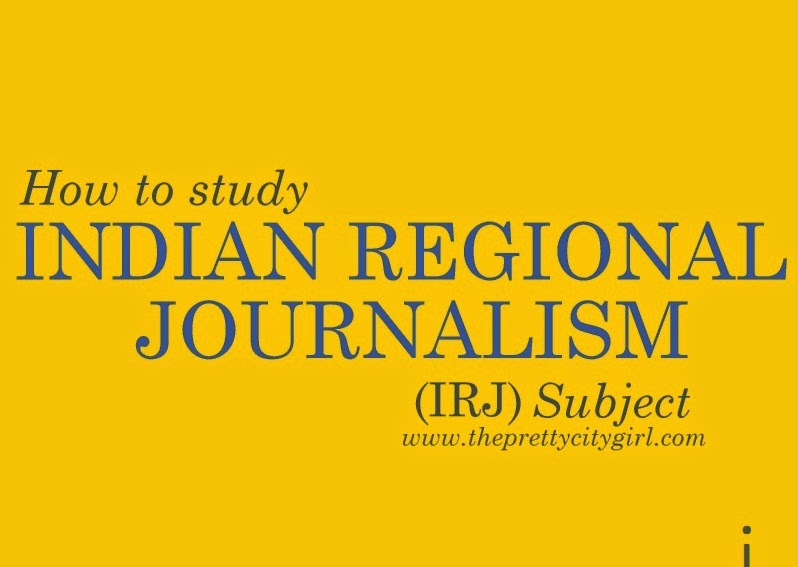 Finally, towards the end I had got a solution for studying Indian Regional Journalism (IRJ) subject. This subject is vast, and basically it is not interesting. Journalism and Public Opinion (JPO) is vast, but at least it has different wars that had happened around the world, and so it is interesting. And what is exactly asked in exam? The question paper, even after having so much of theory, asks about general knowledge type of questions and then ask to support our answers by giving examples related to the language newspapers. So how do we study for this subject? You will get at the most three languages for the internal exam. Make sure you study properly for them. We had Marathi, Malayalam, and Bengali for internals, so I was sort of confident while studying them for finals. Studying for internals would be easy as this would be your first time to study IRJ, and as there would be three to four languages only, you will have more time to study every language deeply. But this does not happen. You often don't study nicely during internals and then end up regretting. No matter you study or you don't, make your own notes. These notes will help you during your finals. The next target would be your prelim. It would be well and good if you study during college or in vacation (if any). Keep in mind that prelims are important. If you give your prelims nicely, I guarantee half the work will be done. Attempt all the questions, and don't rush to go home (or chill with friends). These internals and prelims would help you with your studies. Now for the big exam, you already will be having some notes made by you during these two exams. Keep these notes with you. Now, for every language that you read, make an answer. For example, I made answers of 18 points for Urdu language. I put only the important information. I did not specify the years. I just wrote 'The Bengal Gazette was the first periodical in Bengali language and also in India. It was started by Christian Missionaries.' That's it. This would be my first point. Frame answers for every language, and study them like you study long answers. It is as simple as that. Also, before starting with the framing of the answers, leave space after every language's title. For example, I wrote 'Marathi', and then left six lines below it, and then started framing the answers. I dedicated every language to the known people in my life. For example, Marathi was me, Tamil was my Tamilian BFF, Karthika, Telugu was my school Telugu BFFs, Divya and Disha, Kannada was another Kannad BFF, Pournami, and so on. Therefore, every language I read, I related them with these people. It made learning names of the newspapers easy. Like, I related their choices and personality traits with the names of newspapers. You can do something similar. Now in the space left below the title, mention which person you've chosen as your tool for easy studies, mention the first newspaper of that respective language, mention the important editors of that language, and finally, mention any five important newspapers. Begin writing answers after doing this. Remembering which newspaper belongs to which language is difficult. So mind-map the long answers that you frame. I'm sorry, but you won't have any other option than this. Studying big newspapers would be easy; you have to write about their struggle, their editors, owners, language, and few general points. The editors would confuse you a bit. But they aren't too tough. Whew! That's it. Seems a lot, right? How to Manage Expenses in the Simplest Way!